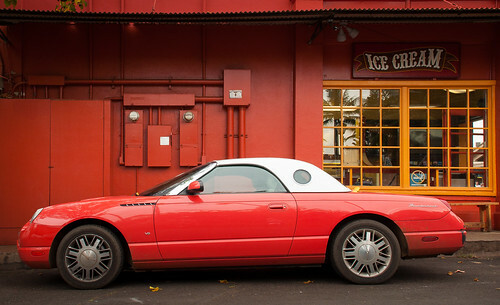 I couldn’t resist grabbing this shot of a Thunderbird sitting outside an ice cream shop in Lahaina on Maui that has similar coloring. I thought perhaps the car belonged to the owner of the shop, because the colors were just too close. I suppose that could still be the case. But when I was back the next day, another car was in its place. I did a little post-processing on this image: cropping and some saturation increase in Lightroom, and I removed two distracting leaves and a smudge of bird poop in Photoshop CC. As ever, click the photo to view a larger, better version.